The careful winemaking in our modern winery results in a deeply coloured wine with refreshing acidity, velvety mouth feel and intense and persistent aromas of ripe red fruit with elegant notes of butter caramel. This is a wine that can be kept in the cellar for 2-3 years. 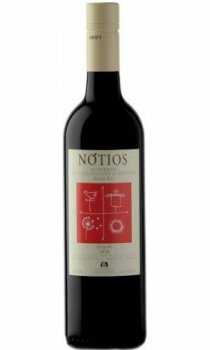 Our Notios Red (Notios in Greek means the Southerner) is produced from selected Agiorgitiko grapes of exceptional maturity that are cultivated in low-yield, non-irrigated vineyards on the hills surrounding Nemea wine region.